Ireland’s top athletes came together last weekend for the National Senior T&F Championships in Santry. Making the podium at Senior level is always a big ask, yet we had a small number of athletes who, not only managed to do that, but took the top prize. Leon Reid of Menapians AC won the 200m on Saturday following a tough tussle with Carlow’s Marcus Lawlor. Reid’s winning time of 20.76 seconds was considerably slower than the Irish record of 20.27s he ran at the start of July when finishing 3rd at the British Championships. On Sunday Leon followed up with a comfortable victory in the 100m (10.42s). Needless to say the athlete was delighted to get the double-double as he won the National Indoors 60m and 200m earlier in the year. Reid received welcome news last week when the IAAF stated that, having last year put a freeze on inter-country transfers, it was introducing new rules allowing transfers to take place again. For the past two years the 23 year old has been waiting for the athletics ruling body to allow his transfer from Britain to Ireland to go through. This means that, all going well, Menapians and Wexford will have an athlete competing at the European Championships in Berlin. There were three further Golds for Wexford. Enniscorthy’s Michael Bowler went one place better than he managed last year in winning the Pole Vault with 4.50m. Bowler has been having a great year with a win at the British University Championships, a Silver medal in the UK Decathlon Championships, with a PB of 7263 points, and Bronze in the British Universities Pole Vault (PB of 4.75m). He has completed his studies at Birmingham University and is now back in Ireland. While Michael hopes to build on what has been a brilliant year he says that he aims to put his expertise to good use “in developing the next generation of combined events hopefuls”. Marco Pons of DMP took the Discus title with a throw of 53.67m. This was in excess of 2 metres better than he threw a year previously when placing 2nd. While the small matter of the Leaving Cert dominated Ryan Carthy Walsh’s early season the young Adamstown AC athlete was able to give the Senior High Jump his full attention. He took the Gold, on countback, notwithstanding the fact that his 2.00m clearance was well down on his 2.11m winning jump of last year. At the end of the day he retained his title and that is what matters. Emma Owens (St Paul’s) won a Bronze medal in Discus with a best effort of 37.95m. In the Hammer she was in 6th place when, putting everything into her final throw, she made contact with the edge of the circle and injured her foot. The injury was serious enough for her to be taken to hospital where an x-ray showed she had broken a bone. Joseph Mooney followed up on his recent win in U23 5k Walk with a 4th place finish in the Senior 10k Walk. Peter O’Shea (DMP), another U23 Gold medalist, threw 53.24m to place 5th in Javelin. 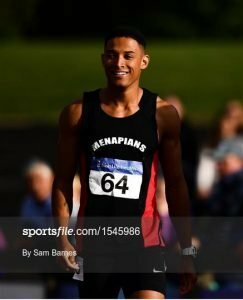 Having recently won U19 Gold and Bronze in Discus (2kg) and Shot Putt respectively as well as picking up Bronze medals in both events at the National Juniors, Padraig Hore of Taghmon AC made the giant step up to Senior competition. His best throw in the Discus competition was in excess of 43m but, as he hit the sideline line, it was adjudged a sector foul. He finished up in 9th place with 34.38m. While this was quite a bit down on the 43.56m he threw in the U19 event (1.75kg) he can be very happy with his season. Other Wexford placings: Aaron Tierney Smith (Menapians) placed 7th in 110m Hurdles. Ciara Wilson (DMP) ran a PB of 17.48.26 to place 9th in 5000m.